The Hilton Hotel in a five-star posh hotel, but according to the locals and guests who visit here, it is a legacy that has been providing effortless services to the visitors. It is a hub for business, cultural exchange and socialising. The unique architecture and the marvellous interiors will leave you in awe. The Guest Room Acropolis option will offer a view of the Acropolis and Lycabettus Hill along with some extra service facilities such as spa, sauna, hammam, gym and indoor pool. Get ready to enjoy first class amenities with the spa, gym, sauna, outdoor and indoor pools, Pilates studio and the steam room. An array of Greek, Mediterranean, Japanese, Fusion dishes along with fabulous seafood are served to enjoy at their rooftop Galaxy Bar. To personalise your visit to the city, you can use an all-inclusive Athens trip planner for the same that will give detailed information about visiting the city. Hotels like Dorian Inn, Athens Golden City Hotel and Athens Center Square will solve your problem of where to stay in Athens. Curated Athens vacation packages await! Book the best ones and start turning your dream into reality.Discover various ways for how to reach Athens and complete the booking by choosing your mode of transport. How popular is Hilton Athens? People normally club together Medusa Art Gallery and Kalamaki Bar while planning their visit to Hilton Athens. Hilton ..... I think that only the name can explain about everything. The old and special hotel in Athens. And in one of the best positions in the Center of the city . Another good thing about Hilton is that they use the top of the top ecological and non toxic cleaning Greek products ..... Factor . Factor cleaning products are friendly for the environment the humans and the animals . For the services there are no votes to add cause 5 stars are nothing .... 10 stars for the employees and all the staff. Congratulations about the hospitality. Nice rooms great location. Friendly and competent staff. One of the oldest chain hotels in Athens. Prices are 5 star hotel prices but nothing too extreme. Bravo! 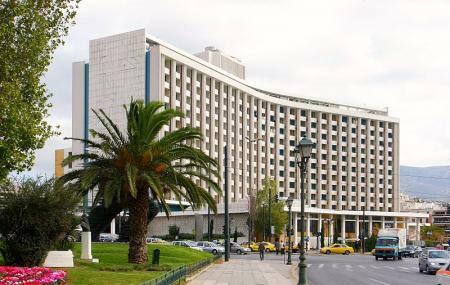 The Hilton Athens is without doubt one of the finest hotels in the Hilton family. The property is meticulously maintained and architecturally beautiful. Milos Athens is a dining experience not to miss. The Galaxy restaurant has spectacular views and a great menu. I was impressed by the high level of service each and every member of the staff provided. I am a faithful Hilton customer and I was impressed by this hotel. I would definitely stay here in the future! Classy, clean, and convenient! This hotel has everything! Views of the Acropolis, great food, fabulous buffet breakfast, huge pool, terrific location. And the Galaxy Restaurant and Bar is THE place to go for views, cocktails and delish fish and sushi.